No x64, and just going by the crashes and what the .exe says in CFF Explorer. And to me >2GB means up to. haha, i am installing it again. That looks Nice. Mine is looking pretty similar now, using a lot of the same mods I think. The only problem I have is about 2/3 of my pine trees are not hd. Which is the HD trees mods fault. I'l try reinstalling all the flora mods and see if that helps..
looks great indeed, even tho im not using the exact ones, also using dynavision instead of ENB DOF, the some ice portions looks a bit too bluish it seems, might have sumthin to do with the real ice mod. hmm thats wierd. I do know that when i tried TreesHD and chose the 4096 resolution version it killed my FPS so i dropped to the 2048. When you do install them again do Vurts first. Then TreesHD and only install the files he has listed on the main page, then get lush trees then the compadibility patch. That is if you want lush trees. You might be running into a vram wall too if some aren't rendering in HD. Ive gottent to areas where hte texture is just smeared all over and then takes a bit to load. Yeah, i reinstalled all my foliage mods, vurts first and so on. Now all the trees are good. And 4096 for all of em too. That and ssao kills my framerates, but heck I'm upgrading to a 7970 soon. So a few mods I been waiting on updating have and now I think I'm ready to actually play again. Setup all of my mods and just making sure the game runs right, then I noticed this table top. I have Skyrim HD and SMIM, both them cover wood textures, you can see the side of that table is better textures. But that top just looks horrible, doesn't even look like it's made out of wood. Wondering what the heck is up with that, I swore one of these texture packs would have changed that table top. Either way, if anyone knows, let me know. And if they don't, does anyone know of a mod that does change them? Has there been ANY news of an expansion yet? I'm nearing the completion for the tweaks and documentation of my custom ENB (based on Superb ENB by Sung, tweaked Realistic Lighting, FXAA for color correction, and lastly, Imaginator settings). I'll be posting my ENB on Skyrimnexus when time permits (still busy at work and still needs some tweaks on the lighting aspect). Any suggestions would be appreciated. I'm gunning for Photo-realism and it really is hard to achieve that. Here are some pics of my latest endeavor. looks good man. It is super hard to me to get skyrim from looking washed out. seemsl ike you have to have a ridiculous amount of contrast. Yeah looks seriously fantastic. 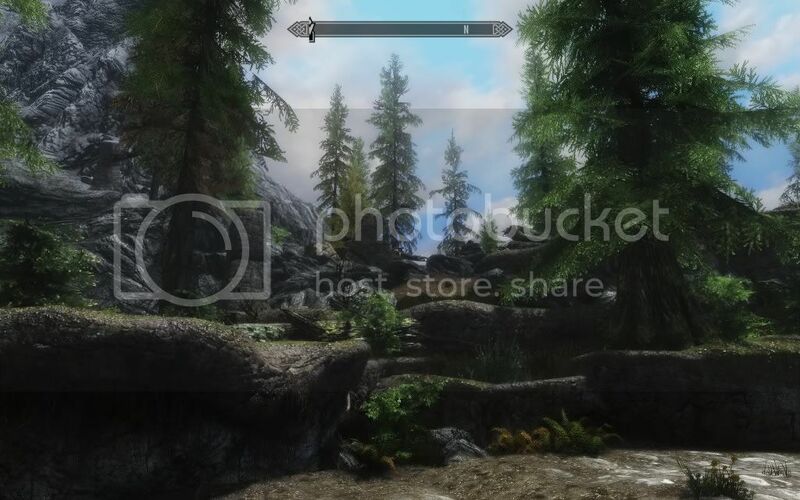 I am using FXAA Inj at present; tried ENB but it crashed at save game load. Maybe if and when I start a new game I'll do a fresh Skyrim install. A lot of the pictures are old so. What FXAA injector are you using? I trued Immersive environment, but it really was WAY WAY to blue. I use my own settings. I tweaked it to work with my ENB settings. I'll try your RL settings and will endorse. Tnx. The textures were much higher resolution on them, and it didn't have that awful white glass. Problem was, they went real light on the Alpha Layers. I wanted glass to be able to see through it well (without zooming it super close, since I want to be able to see through it while just playing the game). So these weren't exactly what I was looking for either, so this morning I started tinkering with Alpha Layer, and so far I'm liking what I see, here's my results so far. Looks much better, I'm not sure if this exactly where I want transparency to be, but it's close (I think a bit more transparency and I'll be happy). It's not as see through once you back the camera off (like I mentioned earlier, this isn't a good view distance to play the game at). I think a bit more tinkering and it should be perfect though, already such a massive improvement. Ok, I have had this game since release and just made it to level 3...... I am starting to like it more and more. Nice. Thats what I've been looking for in a glass mod. What have you been doing?!!? That would be like a couple hours of gameplay. Or a ton of walking around not touching anything.